TAMPA, Fla., December 11, 2013 – Acoustiblok’s All Weather Sound Panel noise barriers installed under the premium seating section of the new east side grandstand at Illinois State University’s $27.6 million renovated football stadium diminishes loud compressor noise and gives fans a better game day experience. All Weather Sound Panels are industrial grade acoustical barrier assemblies used to block excessive noise in industrial, commercial, institutional and community environments. These unique noise barrier panels are not just “sound absorbing” but also “sound blocking.” This allows them to not only absorb the loud mechanical noise, but also stop noise from penetrating through the panel. The renovation of Hancock Stadium was needed to replace the outdated structures in the stadium that had been the home to Illinois State University since the early 1960s. The stadium lacked modern amenities and premium seating and entertainment areas that are common in today’s modern college football stadiums. These premium areas are vital to bringing in additional revenue for the university. The renovation focused on the stadium’s east side area which was rebuilt and transformed into the stadium’s new modern 7-story front entrance and premium seating area. The new east side structure now includes a 5,500 sq. ft. indoor club, seven private luxury boxes, catering area, more modern and expanded concession areas and restrooms, bleacher back seating areas, and a state-of-the art press box among other improvements. The improvements have doubled the seating capacity of Hancock Stadium and have created a stadium that the community can now be proud of. These new indoor areas require ventilation, cooling, heating and also refrigeration for concession and entertainment areas which require the use of noisy compressors. These machines typically result in a combination of two noise sources: noise that was already there in the signal, now amplified; and noise created by the actual circuit design and components of the compressor. Compressors often draw complaints for loud humming, rumbling, scraping, thumping and vibrating, rattling, squealing, or pop and bang sounds. At Hancock Stadium and most stadiums in general, the noisy compressors and other mechanical equipment are located under the concourse level which typically pose a noise problem if not properly addressed with an acoustical barrier like Acoustiblok’s All Weather Sound Panels. These panels are available in various sizes up to 4 x 12 foot, are approximately 2.44-inches thick with aluminum frame and have a perforated aluminum grille. They are all welded, with tubular enforced eyelets in the frame allowing use of anchors or tapcons for wall mounting. All Weather Sound Panels contain the company’s signature product, Acoustiblok sound mitigating material which is a 1/8-inch thick heavy mineral-filled viscoelastic material which stops sound from penetrating through it. This is a very meaningful advantage over conventional "sound absorbing" panels which stop sound reflections but are poor sound barriers. All Weather Sound Panels are rigid and self-supporting. They can be used like building blocks to permanently or temporarily enclose a noise source such as chillers, generators, and other machinery. 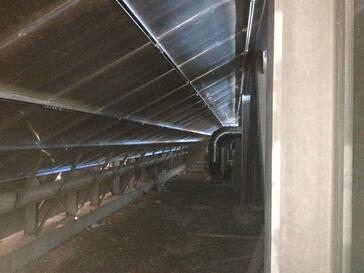 The product widely is used in industrial and commercial facilities where loud, ongoing noise is a concern. David Vance is senior vice president of Associated Constructors, a Bloomington, Illinois multi-trade subcontracting construction company that performed the interior finishing work for the Hancock Stadium renovation project. The company has been in existence for 29 years. 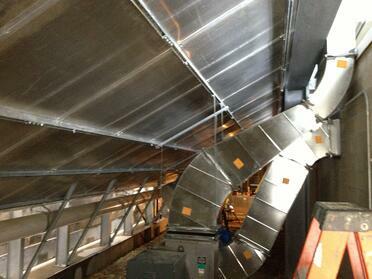 “We installed two sections of Acoustiblok’s All Weather Sound panels in areas that were approximately 16 X 70 feet. The panels were suspended with unistrut metal framing system and 3/8 inch threaded cable rod on the same slope on the bottom of the bleachers,” said Vance. “It was the first time we used these All Weather Sound Panels and they worked out great. The architect liked them too." Marilyn Myers is Chief Operating Officer of Acoustiblok. She coordinated the sale and planning of the All Weather Sound Panels for the projects. “Each noise problem we solve at Acoustiblok has its own unique set of design challenges. There are a lot of design factors to consider when you are trying to mitigate noise in a specific environment. Modern day sports stadiums are unique in that there are both indoor and outdoor areas interconnected. The challenge was to create a sound barrier that mitigated unwanted chiller and machinery noise and keep it isolated so it does not negatively impact the fans sitting above. 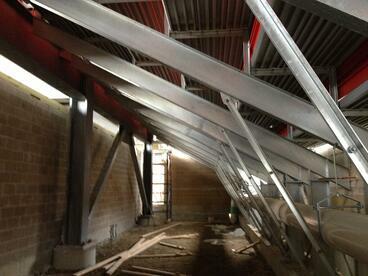 They accomplished this using our All Weather Sound Panels,” said Myers. “Hancock Stadium shows us that Acoustiblok’s All Weather Sound Panels are effective for use in modern day sports stadiums that have chiller and HVAC system noise,” she added. David Vance said his company was pleased with Acoustiblok’s customer service. “Marilyn did a great job and was very responsive to our needs. We got toward the end of the installation and the width was changed and we needed a few custom sized panels unexpectedly. Acoustiblok made them for us quickly and shipped them to us right away. We appreciated their responsiveness and concern for our needs and deadline,” Vance added. Acoustiblok’s All Weather Sound Panels use only the highest quality material and craftsmanship. Strain hardened 0.040" (1.016mm) corrosion resistant perforated aluminum front is resistant to abuse and sharp objects. The heavy duty frames have 18 flush eyelets free from any protrusions or screw heads thus allowing flush stacking and storage. Acoustiblok manufactures two versions of these indoor /outdoor sound panels available: one with hurricane-rated internal reinforcement and one without. They are easily movable and do not need to be permanent as they can be stored in harsh environments without harm from the elements. “The panels were priced right. It’s a good product. We would definitely use the product again,” Vance concluded. Lahnie Johnson is president and founder of Acoustiblok. “We’re very proud of our All Weather Sound Panels and we think it’s a great product. There are many indoor and outdoor uses for these panels,” Johnson said. 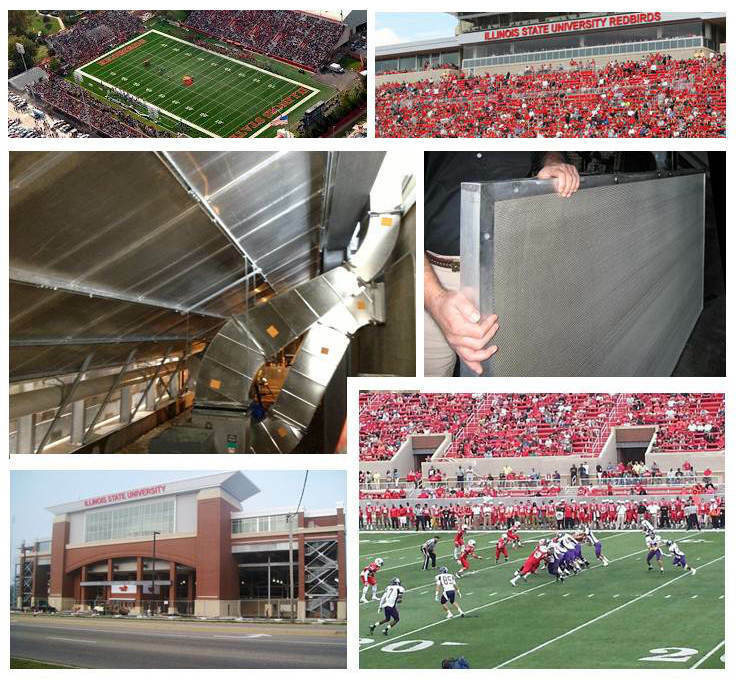 While 2013 ushered in a whole new era of Redbirds football for Illinois State University at the bigger and more modern Hancock Stadium, Acoustiblok’s All Weather Sound Panels are working quietly without fanfare to keep mechanical noise to a minimum. Acoustiblok Inc. ships products to more than 60 countries through a network of stocking distributors in the United States and on five continents across the globe. The company operates a subsidiary, Acoustiblok Mideast, in Saudi Arabia to augment our distributor network. Associated Constructors Company is a commercial, multi-trade subcontracting construction company located in Bloomington, Illinois. The company specializes in light-gauge cold form metal framing, drywall, demountable wall partitions, acoustical ceilings and wall panels, building insulation, lath and plaster, spray fire proofing and acoustical treatments, painting and wall coverings, rough and finish carpentry, exterior insulation and finish system (EIFS), and computer access flooring.